I specifically remember the first thing we chatted about as I walked into this hospital room to meet this couple's beautiful new baby girl. This new mama mentioned how they didnt sleep, at all, that first night. And I think they were both a little worried about looking tired. My thoughts on that are: A.) new parents always look more radiant than they think, because they are bursting with joy. And B.) you just had a BABY! You deserve these photos, and you deserve to look tired and not worry about it. I think she looks pretty perfect. Beautiful baby Rhys (pronounced Reece) is now at home with her adoring parents--in fact we just shot her newborn session! But you can bet their days are filled with a lot of this....staring at their itty bitty baby girl that has probably opened up places in their hearts they never knew existed...touching every toe and marveling at every sound and expression and yawn. 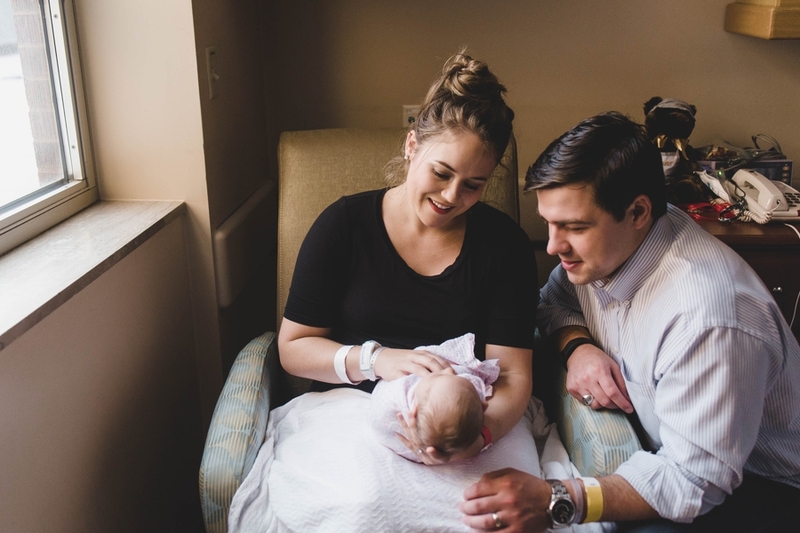 These photos were taken almost exactly 24 hours after she entered the world, and there is just something so special and watching a couple become parents for the first time.